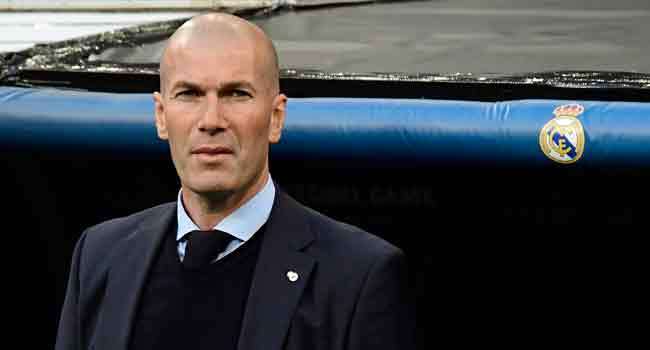 Real Madrid coach Zinedine Zidane said Thursday he was leaving the Spanish giants, just days after winning the Champions League for the third year in a row. “I have taken the decision to not continue next year as Real Madrid coach,” the Frenchman told a hastily convened press conference, before adding he was not looking for another club to coach. “I don’t see myself continuing to win this year and I am a winner, I don’t like to lose,” added Zidane, who was under contract with Real until 2020. Real beat Liverpool 3-1 in the final in Kiev on Saturday, making Zidane the first coach in history to win three successive Champions League titles. Zidane, 45, has now won nine trophies since replacing Rafael Benitez in the Santiago Bernabeu dugout in January 2016. He was flanked at the press conference by Real Madrid president Florentino Perez who said Zidane’s announcement was “totally unexpected”. Zidane said his decision had nothing to do with Cristiano Ronaldo hinting that he will also leave the club.